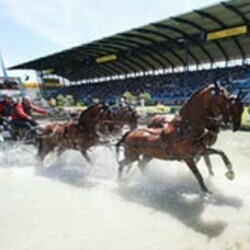 Over two weekends, the CHIO (Concours Hippique International Officiel) transforms the city of Aachen in North Rhine-Westphalia into the setting for the world's biggest equestrian festival. The event features approximately 500 horses and 300 riders, drivers and vaulters from more than 20 countries. The first weekend is particularly attractive for families. It traditionally includes the 'Horse and symphony' concert and an open day on 'Soers Sunday' featuring a varied programme of sports and show events.